The Western Right had a slow year in 2015, with 25 posts, but still had a few good ones. Is Fred Upton More Conservative? 2015 was another year of stalemate in Washington, with Republicans largely conceding to the President on spending issues. The Presidential primary campaigns are well underway. Establishment favorites Jeb Bush, John Kasich, and Chris Christie quickly tanked. The race appears to be down to three candidates. Donald Trump is conservative on immigration but moderate on most other issues. He has a unique style that cuts through the media filter but also misses key facts and unnecessarily offends many. Ted Cruz is a solid anti-establishment conservative who has run a shrewd campaign and has good shot at the nomination. Marco Rubio is trying to bridge the gap between conservatives and the establishment, but will be hampered by his work on the Gang of Eight amnesty bill. Meanwhile, there was one significant conservative victory at the state level. In Kentucky, Matt Bevin was elected Governor. Bevin is a businessman who in 2014 challenged Republican Senate Majority Leader Mitch McConnell in the 2014 primary. He lost, but put up a strong showing that gained him a following around the state. In 2015, he ran for governor, and barely won a three-way primary against two less conservative candidates. He was considered the underdog against democrat Attorney General Jack Conway, a position supported by polls that showed him trailing. But on election day, Bevin won by a nine-point margin. Bevin campaigned on eliminating Kentucky's Obamacare exchange and Medicaid expansion, ending Common Core, passing Right to Work, and other conservative priorities. He will have the opportunity to implement many conservative reforms in a state that has mostly been run by democrats for generations. He is already working to flip the democrat-controlled state house in 2016. Matt Bevin showed that conservatives can win without compromising their principles if they run good candidates with good campaigns. He is 2015's conservative of the year. The state legislature recently passed Senate Bill 13 to eliminate straight-ticket voting in Michigan. The Governor should sign this bill. Democracy works best when voters are informed. At a bare minimum, voters should have to actually read the name of the office and names of the candidates that they will decide between. It is an insult to the candidates and informed voters that some choose to vote in elections without even looking at the names on the ballot. One common objection to eliminating straight-ticket voting is that it would lead to long lines at the polls. This objection is without merit. This might be true if Michigan used direct recording or puchcard machines, but we use optical scan machines that count votes but do not record them directly. The only potential lines at the polls are the line to receive a ballot and the line to submit it, neither of which are affected by the amount of time it takes to fill out the ballot. Only ten states have straight ticket voting, and the other forty seem to manage fine without it. Michigan should join them. Nationally, the election results were pretty good for conservatives, headlined by Matt Bevin's election as governor of Kentucky. Michigan results were less good. Gamrat and Courser were unsurprisingly crushed in their comeback attempt after being kicked out of the legislature. They put themselves above the cause and damaged the conservative movement across the state. They will be replaced by two establishment-friendly candidates. Notably, the state legislature finally passed a gas tax hike the night of the election. This passed thanks substantially to being placed on the ballot when Kalamazoo and Portage had other elections and most townships did not. The democrats who control the county commission will probably put more millages up in the future. Don Cooney finally made it to vice-mayor, bumping down David Anderson. The commission will lurch even further to the left, as relatively moderate Barb Miller and Bob Cinabro will be replaced by Shannon Sykes, social justice consultant, and Erin Knott, Obamacare enrollment organizer. Jack Urban was reelected, and Matt Milcarek bumped appointed commissioner Eric Cunningham out of office. With this group running the show, Kalamazoo will probably have an emergency manager in a few years. 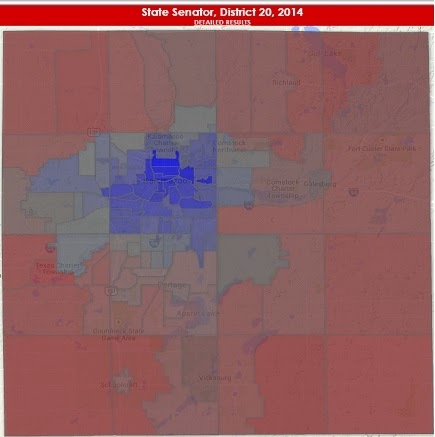 Mitt Romney got 7280 votes in Kalamazoo, but Republicans Hulbert and Youngs didn't find a way to turn them out to vote. VanSweden got 1073 votes despite dropping out. The status quo won in Portage, as the Randall faction reelected all three incumbents up this time. Turnout was very high (31%) due to the school millages. Those millages passed with 64% and 56%, so Portage taxpayers will be supporting new schools and football stadiums for years to come. The following opinion piece appears on the Kalamazoo GOP website. On November 3, voters will be asked to support yet another tax increase, this time claiming to address the issue of homelessness. The Kalamazoo GOP urges votes to oppose this measure. Voters in Kalamazoo County are being subjected to more and more taxes. 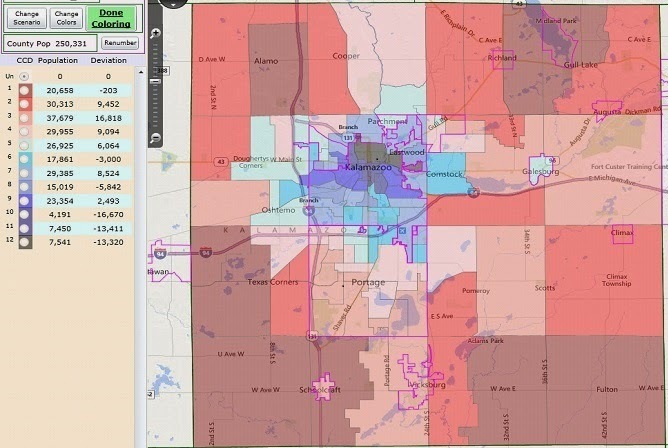 Just in the last year, tax increases for buses and KRESA passed in most of Kalamazoo County. In addition, the legislature passed the “Amazon tax”, and following the defeat of Proposal 1, it is considering a substantial gas tax increase. A city income tax is being discussed in Kalamazoo. We have been taxed enough. The homeless tax was passed by a 6-5 party-line vote by the Kalamazoo County Board of Commissioners. It would increase taxes by .1 mills, generating $800,000 per year. Doubtless most of those supporting the millage have good intentions and sincerely want to address the issue of homelessness in Kalamazoo County. But good intentions are not enough to ensure good policy outcomes. Many policy disasters have been caused by people with the best of intentions. Thus we should ask what the actual effects of this tax increase would be. Recall the basic economic principle of incentives: If you punish something, you will get less of it, and if you reward something, you will get more of it. Thus if people are given money on the condition that they are homeless, you will end up with more homelessness. This may seem counterintuitive to some, but decades of trying to fight poverty with handouts has only served to lock people into poverty. In addition, increasing property taxes, and hence apartment rents, will make life worse for people who are not homeless. Some people on the margin who are just getting by may actually be pushed into homelessness thanks to this tax. We should not forget that there is already an institution in this county fighting homelessness—the Kalamazoo Gospel Mission. It recognizes that to end homelessness requires not just a handout, but a “hand up”, addressing the behaviors and conditions that lead to homelessness. Creating a new government bureaucracy to compete with the Gospel Mission could undermine its effectiveness. Government is usually more wasteful and less effective than the private sector. 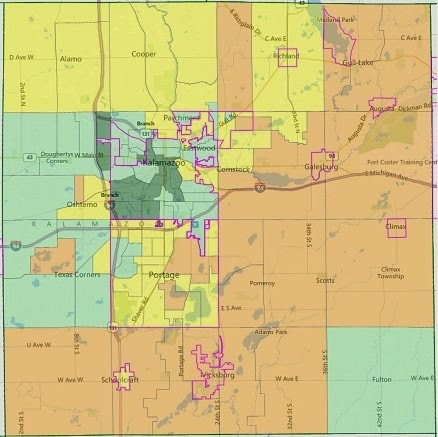 This tax proposal was timed to coincide with city elections in Kalamazoo and Portage, when townships don’t have anything else on the ballot. Please remember to vote on November 3. We urge you to oppose this tax increase. This profound little speech occurs in the middle of the action movie Fast Five. Texas senator and presidential candidate Ted Cruz visited Kalamazoo on Monday morning. He spoke at a rally to an audience of about 600. He gave a stump speech, covering Obamacare, Iran, immigration, Planned Parenthood, his plans for his first day as president, and his family's biography. Cruz' wife Heidi Cruz, campaign volunteer Wendy Day, and state rep Ray Franz spoke prior to Cruz. Media coverage focused on Cruz' response to a question about Syrian refugees. Cruz said that it would be crazy for America to accept Muslim refugees, who should instead be settled in Muslim countries. The Mlive article also gives lavish attention to Lorence Wenke, one of two (!) protesters, who was there promoting his usual hobby horse. Cruz is a true conservative hero and conservative voters should strongly consider giving him support. Back in March, this blog covered a race hoax at Kalamazoo College. There were actually two related hoaxes. The first was a false accusation by a student government leader of racist threats by an advocate for open carry. This was quickly debunked when the actual recording of the meeting showed nothing of the sort. The second hoax was a threat anonymously posted to a student commission Google doc on March 4. K-College officials learned early Wednesday that a "highly inflammatory entry" had been posted in the Student Commission Google Doc, an online collaboration tool that allows for group sharing and anonymous editing, according to an email to the campus community. "The entry is racist, anti-Semitic, sexist and homophobic" and included a direct threat to K-College faculty, the email stated. The post, which included "vitriol aimed at a wide range of campus members," included the following line, according to another email, this one from the president's staff to K-College faculty and staff: "At 900AM 3/5/15 I am going to start systematically executing faculty at Kalamazoo U, that will teach them the value of campus carry." Neither email repeated the entire posting. The police launched an investigation. That email said the Kalamazoo Department of Public Safety and K-College are taking the threat seriously, but KDPS officers believe it likely came from someone not connected to campus and that it is unlikely the person will follow through with the threat. It turns out KDPS went one-for-two on the predictions. Police and prosecutors declined to say who charges are being sought against in the case. However, police reports and search warrants obtained by the Kalamazoo Gazette under the Michigan Freedom of Information Act show that two K-College students quickly became the focus of the KDPS investigation of the online threat. The students, a woman who has since graduated and another woman who was a first-year student, came to the attention of detectives in the hours after the incident. The threat was part of a series of anti-Semitic, homophobic, racist and sexist posts that were entered on the Google Doc between 10:37 p.m. and 11:51 p.m. on March 3. The threat said, "AT 900 AM 3/5/15 I AM GOING TO START SYSTEMATICALLY EXECUTING FACULTY AT KALAMAZOO U, THAT WILL TEACH THEM THE VALUE OF CAMPUS CARRY." So it now seems all but certain that the threat was a hoax by a K College student to revive the controversy that had been dying down. The goal of all this controversy was the creation of an "Intercultural Center", whatever that is. It worked. In June, K College announced that it would create an Intercultural Center. The student(s) behind this hoax should be fully prosecuted, and K College should cancel the Intercultural Center as the fruit of a poisoned tree. UPDATE: Kalamazoo County Prosecutor Jeff Getting has refused to file charges in the case. He claims that the identity of the perpetrator cannot be conclusively identified. The police apparently thought otherwise, since they sought charges. Is liberal democrat prosecutor Getting covering for a politically inconvenient perpetrator? 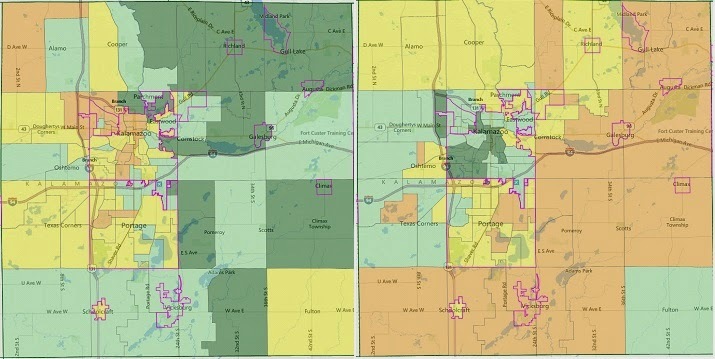 The Kalamazoo Bus Tax passed 63%-37% on Tuesday. While it passed in most precincts, it is worth examining where it failed. The proposal lost in every Comstock precinct except precinct 6 (Gull Road). It lost narrowly in 3 (River St.) and 8 (North Central) and lost handily everywhere else. In Kalamazoo Township, it lost in precinct 2 (Northwood) and won everywhere else. The proposal passed in all precincts in Kalamazoo, Oshtemo, and Parchment. 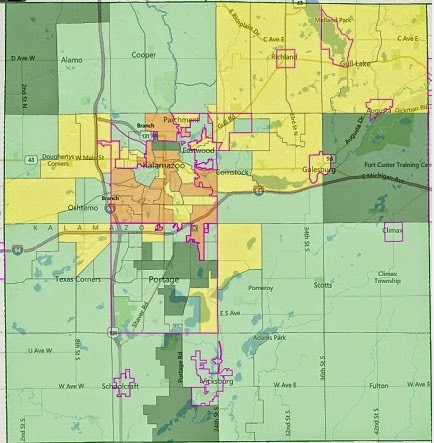 In Portage, the proposal failed in precincts 4/6 and 17 and narrowly passed in 5/10/12 and 7 in south Portage. Thus areas with little or no bus service were the most likely to oppose the plan. While the special district certainly makes most sense than taxing the entire county for buses, it still is unfair to people who are miles away from the nearest bus stop. A better plan would be to allow major institutions like Meijer, WalMart, KVCC, and large apartment complexes to pay for their own bus service--and see how much is really necessary. Cross-posted at The Western Right, Right Michigan, and Red Racing Horses. This post was last updated on August 27, 2016. 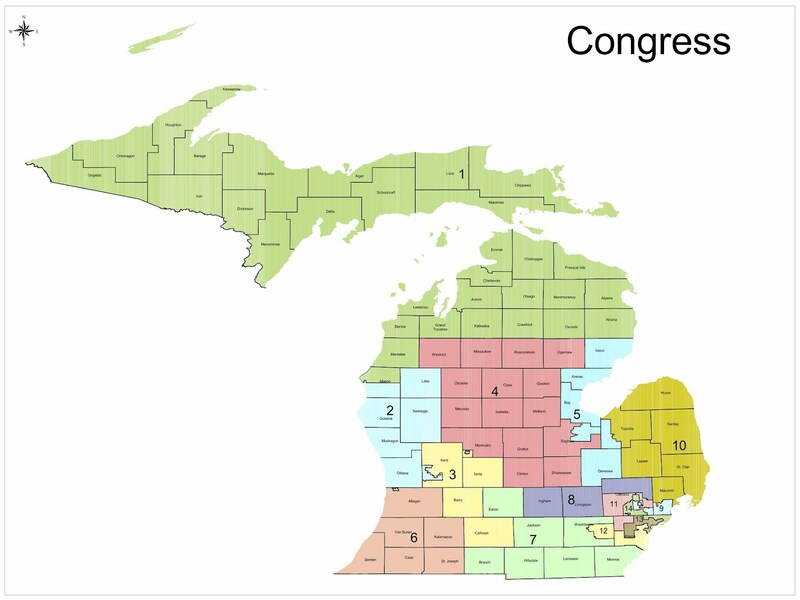 Michigan will see several interesting congressional races in 2016, with two open seats and possible competitive primary challenges. Michigan now has 14 congressional seats. District 1 (Upper Peninsula, Northern Lower Peninsula) Lean Republican. In 2010, Dr. Dan Benishek won an open seat vacated by democrat Rep. Bart Stupak against democrat state Rep. Gary McDowell 52-41 and won the rematch 48.1-47.6 in 2012. He beat former general Jerry Cannon in 2014. Benishek pledged to serve only three terms, but announced that he would run again before changing his mind and retiring. Conservative retired general Jack Bergman defeated moderate state senator Tom Casperson and former senator Jason Allen 39-32-28 in the R primary. Former Michigan democrat chairman Lon Johnson, a liberal who bought a small house in Kalkaska County, beat Cannon 72-28 in the D primary. Republican former state rep. Bill Huizinga won a close primary in 2010 to replace Pete Hoekstra, and was easily reelected in 2012 and 2014. Since then he has generally voted a fairly conservative line. This remains the most Republican district in Michigan. The D candidate is Dennis Murphy. Republican state rep. Justin Amash won the primary to replace moderate Republican Vern Ehlers, in 2010. Amash is a libertarian in the mold of Rep. Ron Paul. He has made some enemies among the establishment in Washington. He defeated moderate businessman Brian Ellis, who had significant self-funding, 57-43 in the 2014 primary. The D candidate is Douglas Smith. Republican state senator John Moolenaar of Midland defeated self-funding businessman Paul Mitchell and Tea Partyer Peter Konetchy 52-36-11 in the 2014 primary to replace retiring congressman Dave Camp. He is unopposed this year. Former Genesee Treasurer Dan Kildee succeeded his uncle Dale Kildee in 2012. The Republican candidate is Al Hardwick. Moderate Republican Fred Upton has won by wide margins since defeating conservative Mark Siljander in 1986. Upton became Chairman of the House Energy and Commerce Committee in 2010. Upton defeated democrat Mike O'Brien 2010, and Western Michigan University professor Paul Clements in 2014. These races were closer than Upton's previous 20-40 point margins. Clements is running again in 2016. District 7 (south-central Michigan) Lean Republican. Republican Tim Walberg defeated liberal democrat Mark Schauer in a hard-fought race in 2010. This followed Schauer's defeat of Walberg in 2008, Walberg's defeat of RINO Joe Schwarz in 2006, and Schwarz's winning a divided Republican primary to replace Nick Smith in 2004. Walberg defeated democrat attorney Kurt Haskell in 2012 and former state rep. Pam Byrnes of Washtenaw County in 2014. He beat Doug North in the primary and faces D state rep (2012-present) Gretchen Driskell, who won 53% and 56% in her Washtenaw district, in the general. District 8 (Ingham, Livingston, N Oakland) Safe Republican. Former state senator Mike Bishop of NE Oakland beat state rep. Tom McMillin 60-40 in the 2014 Republican primary to replace retiring congressman Mike Rogers. Bishop defeated Ingham County Treasurer Eric Schertzing in the general. Actress Melissa Gilbert, who recently moved to the district, dropped out of the race claiming health issues after her campaign flopped. Democrats chose Macomb County assistant prosecutor Suzanna Shkreli as their replacement. Democrat Sander Levin has represented this district since 1982. Levin is more liberal than the district, but he is popular enough to win here as long as he wants. He may be succeeded by a less liberal Macomb county democrat. Christopher Morse is the Republican candidate. Republican Candice Miller is retiring. Rich self-funding businessman Paul Mitchell, who lost the Republican primary in district 4 in 2014 and led the fight to defeat proposal 1, a large tax increase, won the R primary 36-28-16. He beat state senator (2010-present) Phil Pavlov, who has represented most of the Thumb portion of the district, conservative former senator (2002-2010) Alan Sanborn of northern Macomb County, state rep. Anthony Forlini, and David VanAssche. Former state rep Frank Accavitti (2002-2008) from outside the district is the D candidate. District 11 (NW Wayne, SW Oakland, Troy) Safe Republican. Establishment Republican David Trott defeated Tea Party Republican Kerry Bentivolio 66-34 in the 2014 Republican primary. Bentivolio became an "accidental congressman" in 2012 after incumbent Thad McCotter was disqualified in a petition fraud scandal. Trott defeated former diplomat Bobby McKenzie in the general. Anil Kumar is the D candidate. In 2014, democrat Debbie Dingell easily replaced her husband John Dingell in Congress after his 58 years (!) in office. Jeff Jones is the Republican candidate. This district has been represented by democrat John Conyers since 1964. Conyers' image has been tarnished since his wife Monica, formerly Detroit city council president, pled guilty to bribery and served time in federal prison. He won only 55% in the 2012 primary. In 2014, Conyers was nearly disqualified due to having signature gatherers who were not registered to vote, but a judge ordered him back on the ballot. He defeated pastor Horace Sheffield 74-26 in the democrat primary. He beat Detroit City Clerk Janice Winfrey 60-40 in the primary. Jeff Gorman is the Republican candidate. In 2014, Southfield mayor Brenda Lawrence defeated state rep. Rudy Hobbs, and former Congressman Hansen Clarke 36-32-31 in the democrat primary for the seat held by Gary Peters, who was elected to the US Senate. This district has had four different representatives (Lawrence, Peters, Clarke, and Carolyn Kilpatrick) in the last four cycles. Lawrence beat Terrance Morrison and Vanessa Moss in the primary. Howard Klausner is the Republican candidate. One of the arguments used by conservative supporters of Congressman Fred Upton is that Upton is more conservative now than he used to be. Is there any merit to this argument? To analyze this claim, we consider ratings issued by conservative groups over the years. This will make it easy to spot any trend. Of course, the usual caveats apply. These ratings are calculated based on a selection of votes. The votes rated each year are different, but these groups use fairly consistent standards that allow comparison over time. First up is American Conservative Union (ACU), which has been rating Congress since the 1970s. 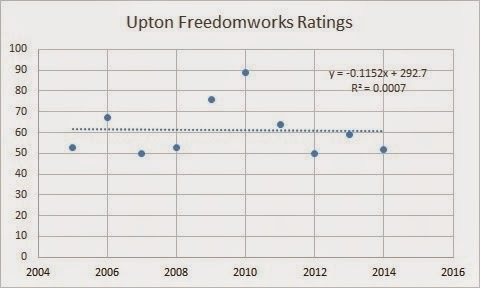 Their ratings for Upton's entire tenure are graphed below. A linear regression line is graphed along with the data. As you can see, the line is virtually flat, indicating no substantial change. There is actually a very slight decrease over time. 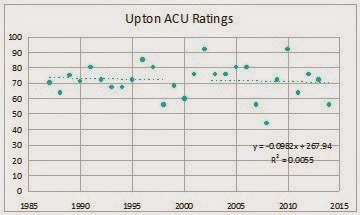 Upton's two best ratings occurred in 2002 and 2010, both of which were years when Upton received serious primary challenges from the right. Many conservatives consider ACU's ratings too generous. More recently, several other organizations have begun their own ratings of Congress. FreedomWorks is a libertarian-leaning organization that has rated Congress since 2005. Once again, the regression line is essentially flat. 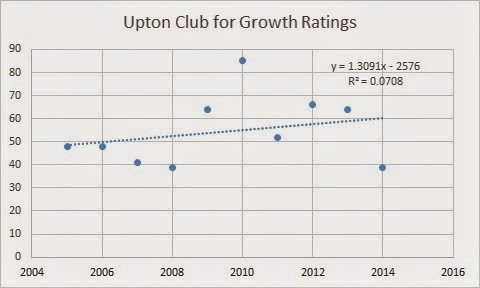 Upton's best year is also 2010. Club for Growth is a free market organization that has also rated Congress since 2005. Here we do see an upward trend, but Upton 2014 rating ties for his worst, so there isn't much reason to expect the trend to continue. Some supporters of Upton will cite his endorsements by Right to Life in 2012 and 2014, after not having been endorsed in any previous years, as evidence of improvement. But this blog has documented Upton's long pro-abortion voting record in the past. He has not publicly renounced these votes, which leads to the suspicion that Right to Life's endorsement was based on political considerations. In fairness, there is one major issue on which Upton's record actually has gotten better. Upton once had a very weak record on gun rights, with a 42% rating from the NRA in 2000. Since then, his ratings have improved. Upton usually votes the party line, but is not a leader on the issue. Overall, though, Upton has not gotten any more conservative over the years. The claim to the contrary is false. Congressman Fred Upton was one of just twenty Republicans to vote for letting illegal aliens join the military. The vote would have actually put illegals ahead of Americans. Upton was the only Republican from Michigan to vote this way. Despite 20 Republicans defecting to join Democrats, Republicans and conservatives won big on Thursday evening: An amendment from Rep. Mo Brooks (R-AL) passed onto the National Defense Authorization Act (NDAA) stripping amnesty for illegal aliens from the defense bill. Brooks’ amendment, which stripped from the NDAA language that was inserted during the Armed Services Committee markup by Rep. Ruben Gallego (D-AZ) —a freshman liberal Democrat who wants to amnesty all the illegal aliens in America—passed the House of Representatives 221-202 on Thursday evening. Gallego’s amendment would have allowed illegal aliens who have received President Obama’s first executive amnesty—the Deferred Action for Childhood Arrivals (DACA), which some 800,000 or so illegal aliens have received—to enlist in the United States military. It would have come with an NDAA that reduces America’s force size—meaning the NDAA would have, if it weren’t for the Brooks amendment bolstered by conservatives like Reps. Rep. Steve King (R-IA) and Dave Brat (R-VA) among others, put illegal aliens ahead of Americans. What’s more, it would have used a defense bill—rather than an immigration bill—to do it. The state senate passed a repeal of the prevailing wage law, which forces the government to overpay for construction projects. The bill passed 22-15, with five Republicans voting no. Many of them previously opposed Right to Work. Notably, Mike Green and Ken Horn, who voted against Right to Work, voted for this bill. Vote NO on Proposal 1! There will also be a KRESA tax increase on the ballot in school districts based in Kalamazoo County. It would be passed through to the districts to increase their budgets. Please vote NO on both of these tax increases. UPDATE: Proposal 1 was destroyed with 80% voting against. It lost every county and every major city except Ann Arbor, East Lansing, and Kalamazoo (which all contain major universities). Now the dems are telling us that this was a rejection of Republicans (so why did dem legislators vote for it?) Meanwhile, the major media (which endorsed it) says that this was not a rejection of tax increases. Conservatives need to watch the legislature carefully and push for spending cuts, not tax increases, to provide additional money for road repair. What's going on at Kalamazoo College? K College is a far left elite private college just west of downtown Kalamazoo. It was originally founded as a Baptist college, but that influence is long gone, replaces by progressivism, social justice, gay rights, anti-racism, and all the trendy cultural Marxism common on campus. The current controversy involves a student who is a gun rights activist. He has advocated for open carry on K's campus, a noble but hopeless cause at an extremely left-wing private college. In late February, he asked the student government for support for this cause. They predictably declined, and launched a flurry of insults, as reported by Campus Reform. When the student government declined to support the group, the student "basically flashed his empty holster at the entire commission and directly threatened all the people of color in the room," Brown said. It doesn't seem a stretch to call her insane. Brown resigned her position in the student government soon after, claiming that "black and brown bodies" didn't feel safe on campus. She then started the hashtag #unsafeatK on twitter, which attracted the attention of the Kalamazoo Gazette (Mlive). They reported her allegations without much skepticism. The group's list of demands include having an interim intercultural center by the start of the 2015-16 school year, increased transparency from the college regarding intercultural and diversity research and planning, and that the college require all faculty, staff administrators and student leaders to participate in anti-racism training. "I've had professors ask what am I, as opposed to where am I from," Solis said. "Replying to them 'student' or 'a woman' is not sufficient for them. When they ask me, 'Where are you from' and I say 'Chicago,' I receive, 'Where are you really from?'" So far, the administration hasn't given in to the students' demands, but I wouldn't bet that they won't. Do parents know what education their children are getting for over $40,000 per year?